Jan 24, 2018 (LBO) – Sri Lanka’s Central Bank Governor Indrajit Coomaraswamy says the government will introduce a cost reflective pricing formula for both fuel and electricity this year. The IMF said in its latest report that domestic prices of fuel and electricity are expected to be determined by a formula introduced in March and September this year. “Over 90% of CPC, CEB losses are due to the fact that they subsidized fuel and electricity. Government forces them to sell at an administrative price below cost but yet it doesn’t compensate them for subsidies,” Coomaraswamy said. 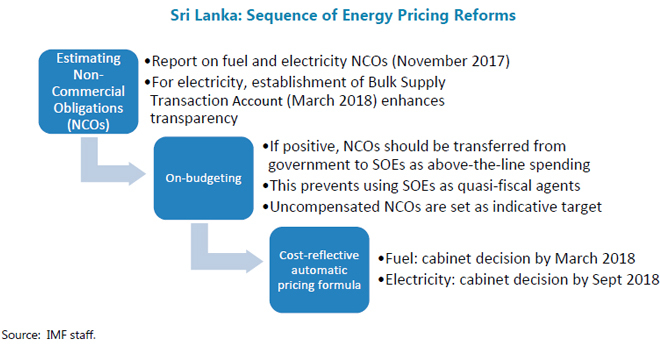 The IMF, however, highlighted that SOE reforms should progress without further delay and the cabinet decision to introduce cost-reflective pricing formula should be made by March this year. According to IMF, the cabinet decision to introduce a cost-reflective automatic pricing formula for electricity should be made by September this year. “If we are able to get this cost reflective pricing formula into place for fuel and energy it will again remove a major distortion in the system,” Coomaraswamy said.